Get an amazing experience for 4 nights / 5 days Cairo and Luxor tours package to discover the ancient Egyptian civilization and the glory of Egyptian pharaohs by casting your eyes on the most famous landmarks in the best tourist cities in Egypt, “Cairo and Luxor“. Visit the pyramids of Giza, old Cairo sightseeing, Karnak temple, Valley of the Kings, Queen Hatshepsut temple, Colossi of Memnon, and more. Don’t miss the chance and live your dream vacation, Book Us Now! 3 Nights accommodation in Cairo at 5* hotel based on B.B. 1 Nights accommodation in Luxor at 5* hotel based on B.B. Flight tickets from Cairo to Luxor and return. Private expert Egyptologist guide during all tours. The service of meet and assist upon arrival and departure . 2 lunch meals during your Cairo and Luxor tours. Sit back and relax while you enjoy a colorful belly dancing show with a folklore band, featuring the unforgettable tannoura spin, in keeping with Egypt’s whirling dervishes tradition, then you will be transferred back to your hotel for overnight. Giza Pyramids complex is the famous historical and tourist attraction in the world. The complex includes three main pyramids, six little pyramids, the great sphinx and the Valley Temple. The complex dates back to the 4th dynasty 2400 years B.C. It is the oldest and largest of the three pyramids of Giza plateau and the only one to remain intact from the 7 Wonders of the Ancient World. The height of the great pyramid is 147 m, the number of stones used in construction is 2,300,000 and it took twenty years to be built. The sphinx was built to protect the complex from the enemy, this was the purpose of it in beliefs of the ancient Egyptians, the statue belongs to King Chephren, standing 73 m. long, 19 m. wide, and 20 m height. It is the oldest known monumental sculpture. It is considered to be the earliest large-scale cut stone construction, it dates back to the reign of King Djeser who ruled Egypt during the 27th century B.C. The step pyramid consists of 6 steps built atop one another with a height of 62m. Finally, we drive you back to your hotel for overnight in Cairo. Mohamed Ali Mosque was constructed between 1830 and 1848, the mosque named ” The Alabaster Mosque” because most of the walls made out of pure alabaster. The mosque is a replica of the Blue Mosque in Istanbul. No visit to Cairo is Completed without a stop at the Khan El-Khalili bazaar, the bazaar is the oldest and the most famous in the middle east. It was constructed in 970 AD, the same year as the founding of Cairo. At the end of the day, we will catch the flight to Luxor for overnight at 5* hotel. No site in Egypt is more impressive than Karnak. It is the largest temple complex ever built by man and one of the top Luxor tourist attractions. It represents the combined achievement of many generations of ancient builders and Pharaohs. The temple of Karnak is actually three main temples situated on 247 acres of land. Finally, you will catch the flight back to Cairo for overnight. Breakfast at the hotel then our representative will transfer you to the airport and assist you at the airport through final departure formalities to end your 5 days Cairo and Luxor tours package. Found Egypt Portals through various reviews and was impressed by its excellent rating. Ahmad was very helpful and our tour guides, Galal in Luxor and Aswan and Reham in Cairo are exceptional Egyptologists who are passionate about their history. It was a very enjoyable trip. We feel very safe and well looked after. Very smooth and hassle free. Wonderful wonderful experience. 4 day tour was fantastic and very hassle free! Our first tour guide in Cairo, Ahmed Dahab, was extremely knowledgeable and fun to spend time with! He follows the schedule set by the tour but he didn’t force us to follow set timelines if we wanted to stay at some places for longer or shorter periods of time. He took care of EVERYTHING for us…he checked us in to our hotels and kept track of all our flights and transportation. His recommendations for restaurants, etc were also great. All we had to do was enjoy ourselves in Cairo and the Giza Pyramids! Free camel rides by the pyramids was also so much fun! The two day tour in Luxor with our guide, Galal, was great and we got to see a lot of temples on the east bank and the valley of the kings in the west bank. The mornings were packed with activities and Galal gave us good options to choose from with regards to visiting local areas that made handmade items. The horse carriage tour through the market was a great addition to the tour (approx $30 extra) and this included physically driving through a local bizarre, freshly made sugar cane juice, drinks at a cafe and dinner. I would recommend this option if you have a free night in Luxor. The original itinerary was supposed to consist of one full day in Luxor and the a flight back to Cairo in the morning but it got changed to two nights in Luxor and only two days and one night in Cairo. The afternoons in Luxor were completely free for us. This is great if you want to spend some time exploring the city or lounging around the nice hotel/pool areas but we could have done all activities in Luxor in one day and we wanted to spend more time in Cairo since the last day at the bizarre, mosque, church, synagogue, and Cairo Museum was extremely rushed and we didn’t get to do all of the activities. The tour management was accommodating when we were planning our trip but just make sure that your original itinerary doesn’t get changed. The Cairo museum is gigantic and I wish we could have had more time there. Otherwise, FANTASTIC trip with great people! I highly recommend the 4 day tour!! Anything shorter wouldn’t be enough time to see all the great things Egypt has to offer! This is one of the best tours I have ever taken! My girlfriend and I booked a 5 day tour to Cairo, Aswan and Luxor. Super organized! We had enough time to visit all the highlights and our tour guides Ayman, Hammet and Mohammed were AMAZING! Friendly, patient with pictures and our preferences and needs! Very competent team! I highly highly recommend this agency you will not be disappointed and will see the best Egypt has to offer through it! 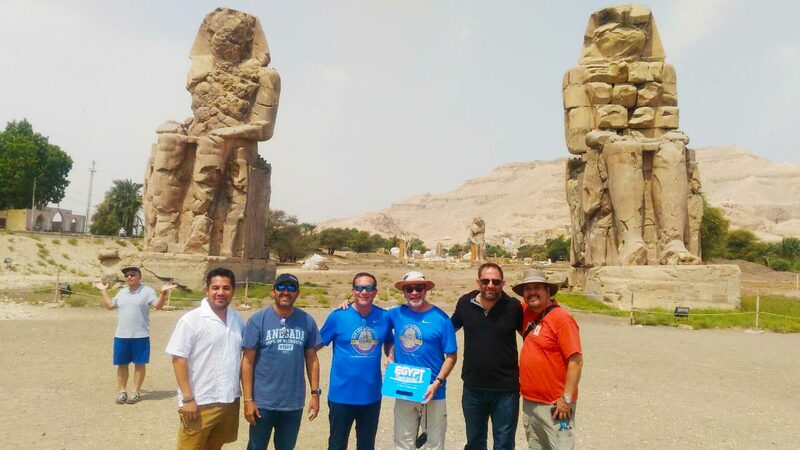 We had an amazing time with this team from Egypt Tours Portal. The guides, drivers and assistants were detailed, friendly and super competent in everything they provided to us! We had three fantastic guides: Hemmat Mohammed and Aiman (see pictures) who are knowledgeable and sensitive to any need or preference. They have a lot of initiative, are really nice people and have passion for sharing the history and culture of Egypt. We had an exceptional and memorable trip! Egypt Tours Portal is definitely a reliable tourism agency! Thank you very much for the amazing work you did for us! Everything ran like clockwork as per the itinerary we’d been sent before our arrival in Egypt. We had 2 sightseeing days in Cairo and 2 in Luxor and over that time 3 amazing guides – Ahmed, Susie and Sammy – all very knowledgeable, friendly, considerate, happy to change timings to suit us and our moaning children where necessary. The 4 days we spent with Eqypt Tours were brilliant and a great way to see the main sites in Egypt. There’s no way we would have seen half of what we did if we were on our own, let alone go to eat in good places and buy sensibly priced souvenirs (& a fab carpet!). Would definitely recommend using this company if you’re in Egypt!